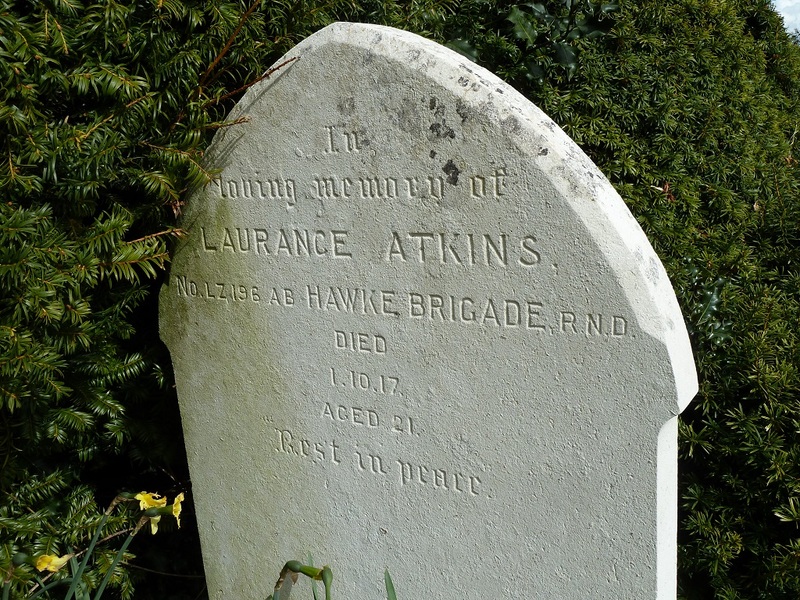 Laurence Atkins was not a resident of Rogate, nor is he listed on the War Memorial. He was a member of Hawke Battalion and was wounded on the 1 August 1917 and died at Clayton Court Auxiliary Hospital, Hill Brow. He was buried in Rogate Cemetery. Laurence Arthur Atkins was born in Soho London, on 6 July 1895. He was the youngest of two children of Frederick Robert Atkins, who was also born in Soho, a Boot Closer, and his wife Nellie Eliza Atkins, a dress maker, from Marylebone. In 1891 Laurence and his parents and brother were living at 115 Great Titchfield Street. In 1901 the family lived at 59 Berwick Street in London. Laurence was an Able Seaman who had joined the Royal Naval Volunteer Reserve on the 8 September 1914. Initially from 22 October 1914 he was in Nelson Battalion with the Service Number K/891. He left the Battalion on 15 October 1915 and was invalided back to the UK on 12 December 1915 with Typhoid. On 2 January 1917 Laurence was drafted to the BEF as a Signaler and on 23 January 1917 joined Hawke Battalion. Laurence received a shrapnel wound to the right knee on 1 August 1917 and was invalided back to the United Kingdom on 8 August. At 9.00pm on 1 October 1917 he died whilst at Clayton Court Auxiliary Hospital from Septic Pneumonia. His relatives were present at his death. Laurence was buried in Rogate Cemetery.